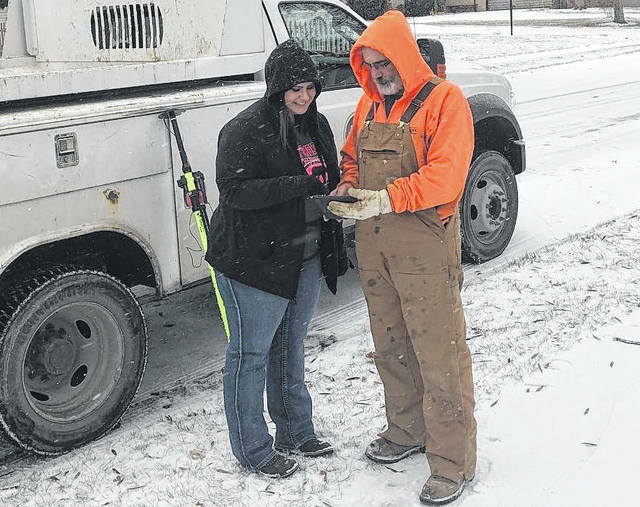 City of Delaware Public Utilities Department geographic information system (GIS) technician Janelle Valdinger, left, shows co-worker Ron Spring how to update work orders in the field using one of department’s new tablets. With new tablets in hand, City of Delaware Public Utilities Department employees are now spending more time in the field making sure the city’s water, wastewater, and stormwater systems are fully operational. Public Affairs Coordinator Lee Yoakum said since early December, public utilities crews out tending to line repairs, locating utilities, and handling general service calls have been doing their jobs more efficiently thanks to the implementation of tablets and the use of GPS technology, both of which are serving their intended purposes. Thanks to the tablets, the days of sitting down at a desk to type in data is becoming a thing of the past as crews are now able to enter it in the most efficient way possible — right on the spot. He added within the first two weeks the tablets were in use, crews were able to enter the same amount of work orders into the Cityworks Server AMS and PLL (Permits, Licensing, and Land) system that had previously taken two months to complete in the past. The Cityworks system, Yoakum said, is a GIS (geographic information system)-centered computer platform that helps the city manage, track, and analyze its infrastructure assets. “It (Cityworks) also includes an integrated permit management system which extends our management reach to include activities done on residences, commercial, and other infrastructure,” he added. While the introduction of the new tablets is ongoing, once fully implemented later this year, Yoakum said there will be approximately 10 to 12 tablets in use by public utilities crews. In addition to being more efficient through the use of tablets, city crews are also relying more heavily on the technology used on a daily basis by people navigating their way through the city and surrounding areas — GPS. While tablets, GIS, and GPS technologies have been around for a while, Yoakum said the city wanted to make sure the time was right before making the move. “Only recently has the security reached a level that we are comfortable integrating the devices with our Cityworks infrastructure tracking system,” he said. As for the financial costs associated with the implementation of the new technologies, Yoakum said it’s roughly $6,000.